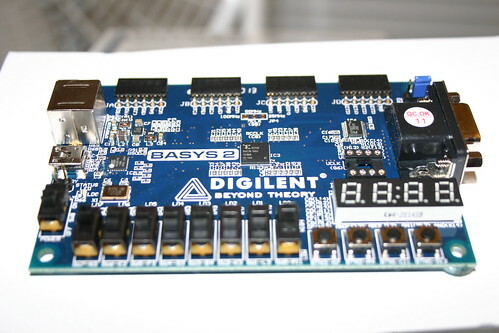 I purchased a Digilent BASYS2 FPGA to continue my efforts with OISC. It includes four seven-segment displays, USB 2.0, VGA, four momentary switches, eight switches, and a PS/2 port. The built-in demo shows color gradients(RGB332), a counter on the seven-segment displays, and results when buttons are pressed. The included loadable demo shows reading PS/2 scancodes. 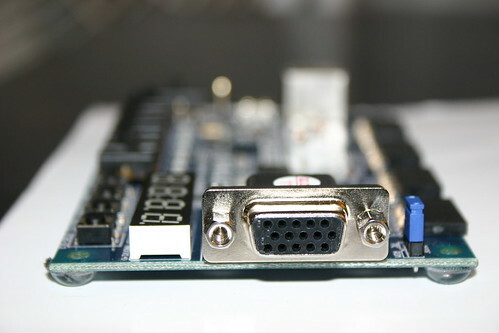 Possible uses include a USB terminal, by programming USB to act as a baudless serial port, and using the PS/2 and VGA for user I/O. 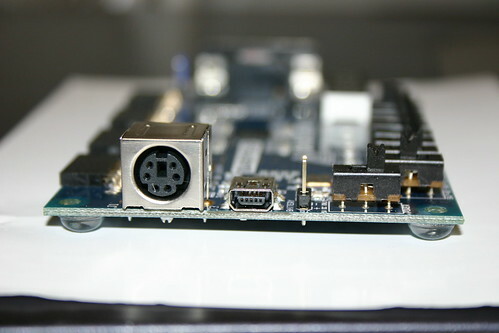 The chip is a Xilinx Spartan 3E-250, although a 100,000 gate version is available for slightly less. Sadly, the development tools are over 4GB, and hosted on a slow server. Digilent did include a nice utility for installing new FPGA configurations, but I cannot get it to work with Windows 7 x64. Windows XP 32, Ubuntu 64, Debian 64, and Ubuntu 32 worked fine. Packaging is cool. 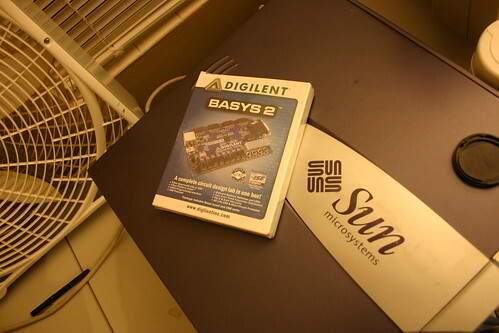 The whole system fits in a multi-DVD case, and Digilent includes a free stretchy/clicky USB cable.